Welcome to Twitter in Focus where media comes to die! Today’s contestant is fava bean eater and Norse God, Anthony Hopkins. Let’s see what he’s tweeting. Does Michael Bay travel with his own lens flare? That must be one swanky hotel if a movie star is tweeting about it. He’s really into art. I always picture him a Renaissance Man. Must be nice. L.A. with money! Note to self. Write script where Anthony Hopkins is a famous painter…that hunts vampires. Ooo, he kills the vampires and turns them into art! Inspiring. Even better when you read it in his voice. That was a huge bummer. So many talented people have passed away these last two years. Does Michael Bay’s star explode every hour on the hour? It should. This is the classiest Twitter account ever. Okay, let’s rate AH. Wow, class all the way. I give him an 8 for Mustness, an 9 for Insanity (because you have to be a little crazy to be an artist) and a 10 for Style. That’s an overall score of 9, but I’m bumping it to 10. 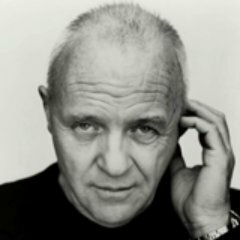 You have to follow Sir Anthony.